Increased runoff from development combined with a surge in damaging storms can cause devastating erosion along streams, rivers, ponds, and lakes and increase sedimentation along these waterways. 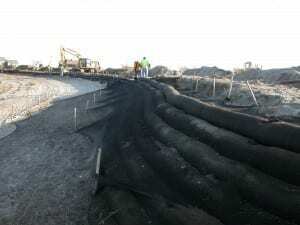 All Habitat Services works with a variety of materials including geotextile fabrics, rip rap, and native vegetation to stabilize banks and help prevent further erosion from occurring. We use innovative solutions that mimic natural conditions and equipment that limits disturbance in these sensitive areas to help ensure habitat recovery. Some of the most affected areas are along the coastline where wind and wave action have pounded the shoreline. We are working to restore and enhance natural dunes to prevent the devastating damage we have seen in recent years. Recent projects All Habitat Services has completed.